What is the Ideal Dog Fence in Richmond? Looking for the right dog fence in Richmond? A fence is a necessity if you own a dog, and not just any old fence will do. The fence needs to be the right height and the right material to serve the purpose of keeping your dog safe in your yard. So what’s the ideal fence for a dog in Richmond? Read on to find out! What is the Ideal Dog Fence? A good dog fence needs to be two things: tall, and impenetrable. By impenetrable, we mean that it can’t allow space for the dog to wiggle its way out to chase that squirrel that just ran by. So a 3-board paddock fence, for example, wouldn’t be a good fence for a dog, especially a smaller breed that could easily fit through the space in between the boards. Keeping this in mind, there are several fences that work well for a dog. Wood picket fences are great because there is minimal if any space at all in between the boards, allowing no room for the dog to try to escape. Chain link fences are another good fence with minimal space in between the links. PVC vinyl fences can be constructed with a dog in mind as can an aluminum or steel fence. Even an ornamental steel fence can work for a dog as long as it doesn’t allow room for the dog to get free. Height is the other factor you want to keep in mind when getting a fence for a dog. Smaller breeds will need a shorter fence, while larger breeds may require one that is slightly higher. Do some research on your breed to see how high it can jump and base your fence height requirement off that. For a classic look, you can’t beat a wooden picket fence for dogs. 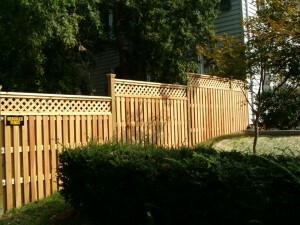 Wood fences can be painted in any color and will add plenty of curb appeal to your home. Contact Hercules Fence of Richmond today for more information about the right fence for your dog! This entry was posted on Thursday, August 14th, 2014 at 9:03 pm. Both comments and pings are currently closed.